With $30,000 from the Alzheimer’s Art Quilt Initiative researchers at the University of Michigan were able to create new molecular tools that show promise for cleansing the brain of amyloid plaques, implicated in Alzheimer’s disease! The plaques — a hallmark of the disease —are thought to contribute to cell death, leading to devastating memory loss and cognitive decline. Learn how quilters are stitching towards a cure. Read the AAQIUpdate blog! Hats off to Sharon Pederson, and her Nine Patch Media business partner Elizabeth Phillips, for putting together the Rose of Sharon project. 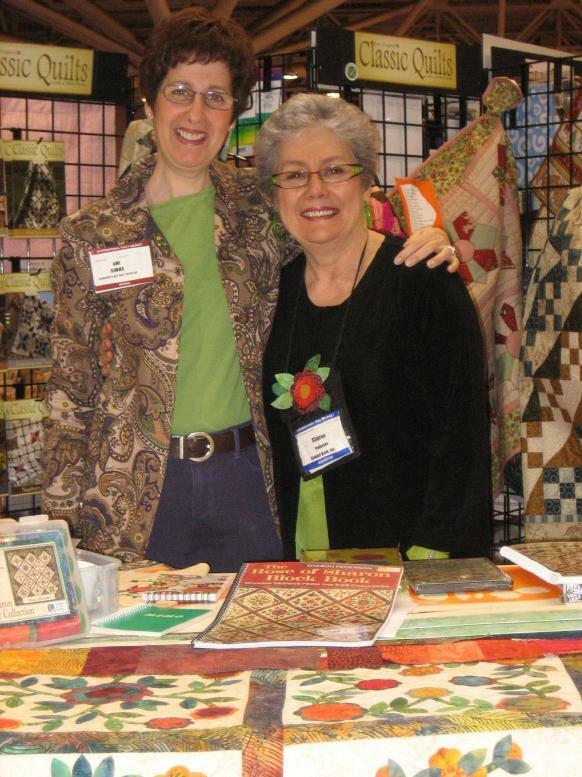 It was premiered at the International Quilt Market in Minneapolis last weekend where quilt shop owners go for the newest fabrics, thread, books, and gadgets. The Electric Quilt Company hosted the Rose of Sharon block contest at the end of last year which netted 850 different blocks made by designers in 11 countries. Sharon and Elizabeth whittled the entries down to 50, and Alex Anderson and Ricky Tims selected the top 12 designs for Sharon’s quilt shown here. 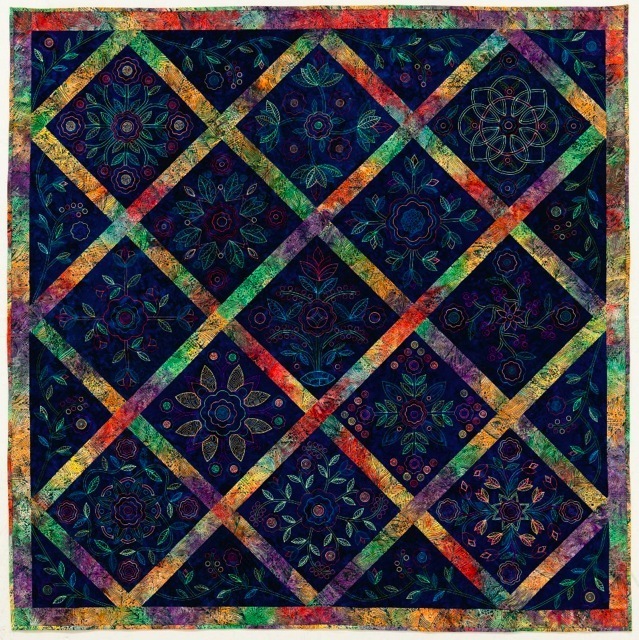 It’s called “Roses of Remembrance” because Sharon and Elizabeth made the project into an opportunity for the designers to share their connection with Alzheimer’s (if any) and for the partner companies to support the Alzheimer’s Art Quilt Initiative (AAQI) in the fight against Alzheimer’s. Sharon made the quilt reversible. On the back of the quilt you can really see Barbara Shapel’s quilting! Sharon’s new “Rose of Sharon” book, due out this fall (Martingale & Company), includes an introduction I wrote about my mother and the beginnings of the AAQI. Sharon’s “Rose of Sharon” instructional DVD from Nine Patch Media will also be available soon. 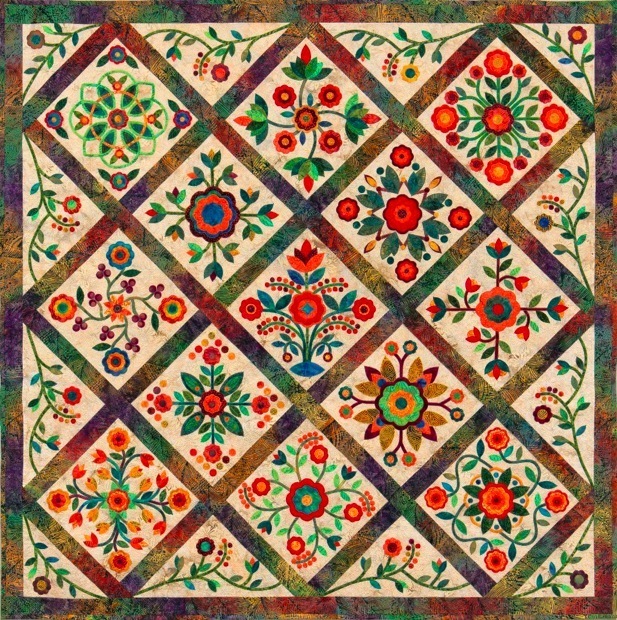 Shops throughout the country will be able to offer quilters a “Roses of Remembrance” BOM (block-of-the-month) with fabrics from Island Batiks. AccuQuilt has Go! Dies for all the Rose of Sharon appliques, and Oklahoma Embroidery Supply & Design (OESD) has each block design digitized for machine embroidery and/or applique. Aurifil has put together two Rose of Sharon thread collections to stitch and quilt everything together. Quilt Market is always exciting, but this year it was especially so. I’ll Be On The Quilt Show! Yours truly will be a guest on The Quilt Show! Look for me on a monitor near you some time at the beginning of 2011. If you can’t wait that long, and you’re a member of The Quilt Show, come to the taping! It will be on August 10th and “admission” is a completed, fully registered Priority: Alzheimer’s Quilt! Alex and Ricky are making my dream come true — to look out over the audience and see every single person holding a little 9″ x 12″ donation quilt for the Alzheimer’s Art Quilt Initiative. Either that, or possibly catching a glimpse of George Clooney in the back row. I could go either way. Space is VERY limited. Put “Ami Simms” in the subject line when you request tickets for the August 10th taping. If you can’t make the taping but you’d like to influence history, in your comment to this blog post tell me what you’d like me to do on the show. Let me rephrase that. I’m not showing my hand-dyed underpants, juggling is out, and there will be no cooking segments. What else are you interested in seeing? What questions about the AAQI can I answer for you? What skills are you all excited to learn that I might happen to know? What annoying habits should I try to stifle? All suggestions/comments welcome. Tell your friends. And send Rolaids. I’m already getting nervous. 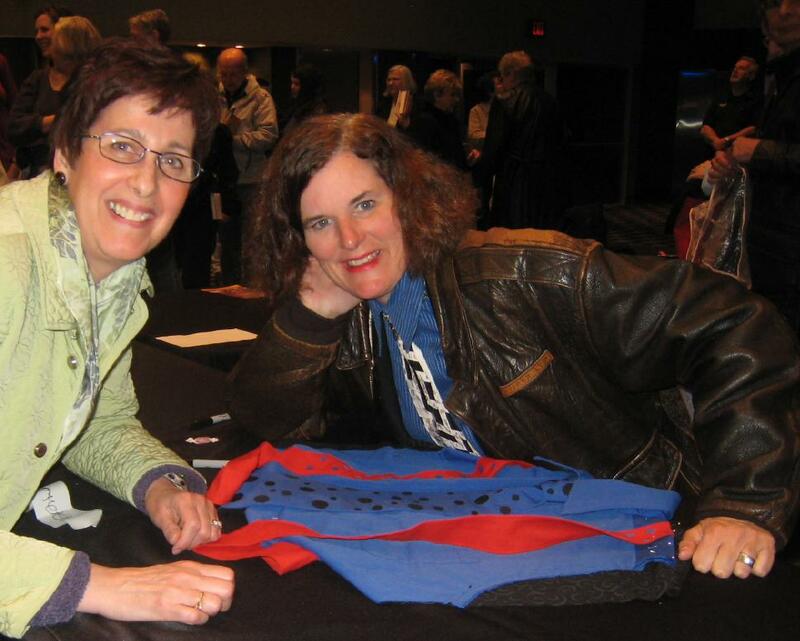 Last week I had an opportunity to see Paula Poundstone perform. She was hysterical! If you ever get a chance to see her, go! 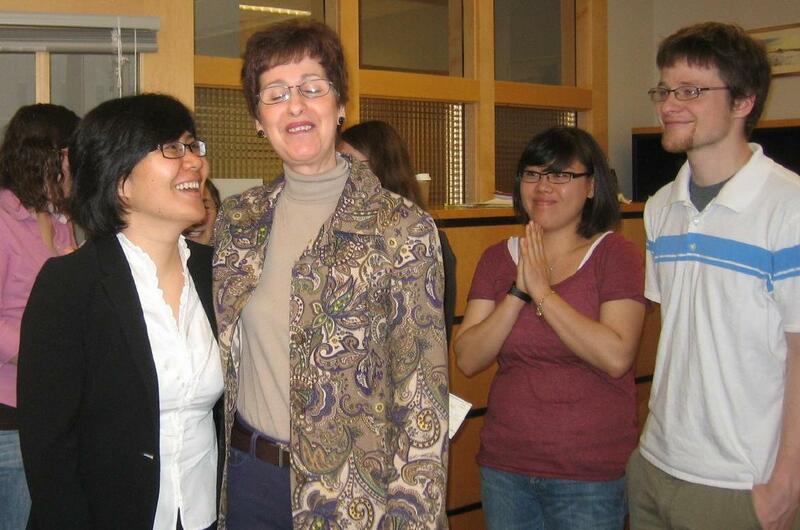 She had us laughing for two hours straight and then came out afterwards to greet people and give autographs. She was so generous with her time, talking with everyone in line and posing for pictures. Not one to miss an opportunity, I put together a little quilt for her to sign. More acturately, I brought her a “quilt” held together with more pins than thread, but she got the idea. As soon as it is finished it will be auctioned off to benefit the Alzheimer’s Art Quilt Initiative. I’ve read her book and saw photographs of her, but a good look at her web site helped me decide just what to do with the quilt. I went to the Salvation Army and picked up a blue shirt for the front of the quilt. I cut away the sleeves and the back and made a polka dot tie from the leftover fabric. The suspenders are red and polka dotted too, except for the area on one where she wrote a message and signed her name. I’m hoping when the quilt is finished she’ll tell all her fans to bid on it. Meanwhile, there is the “practice” signature I just happen to have, black pen on white fabric. Convince me you are the quilter to turn it into a another Priority: Alzheimer’s Quilt. 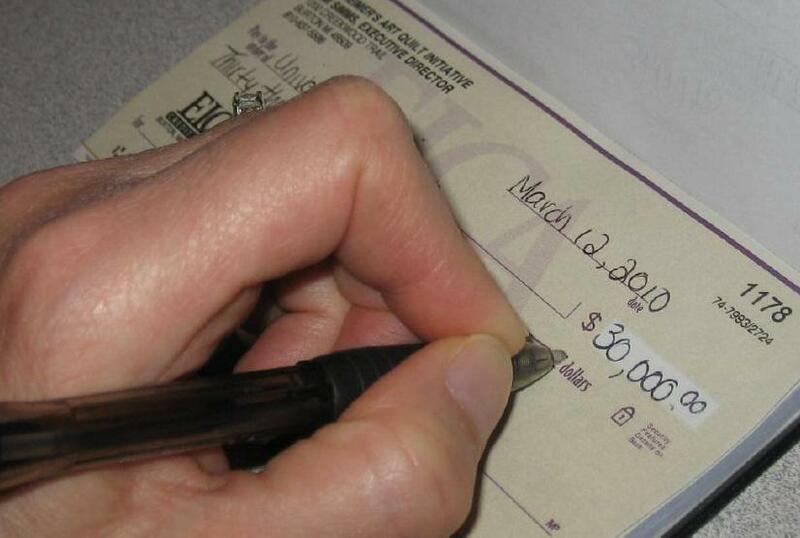 I Just Wrote A Check for $30,000! I just wrote a check for $30,000 and it felt GREAT—as soon as my heart stopped racing and I made sure I spelled all the words correctly. That much money, well, I don’t know about you, but I get a little tense. Writing checks to pay for Alzheimer’s research is the best part of my duties as Executive Director of the Alzheimer’s Art Quilt Initiative. I know there are some organizations who can give far more than we can and would consider a check for $30K a piddling amount. But I know how we earned it: one quilt at a time. I can’t tell you what a thrill it was, and how grateful I am that quilters throughout the United State (and beyond) made this grant possible. This is the AAQI’s third research grant that we have funded directly and it is our largest one to date. 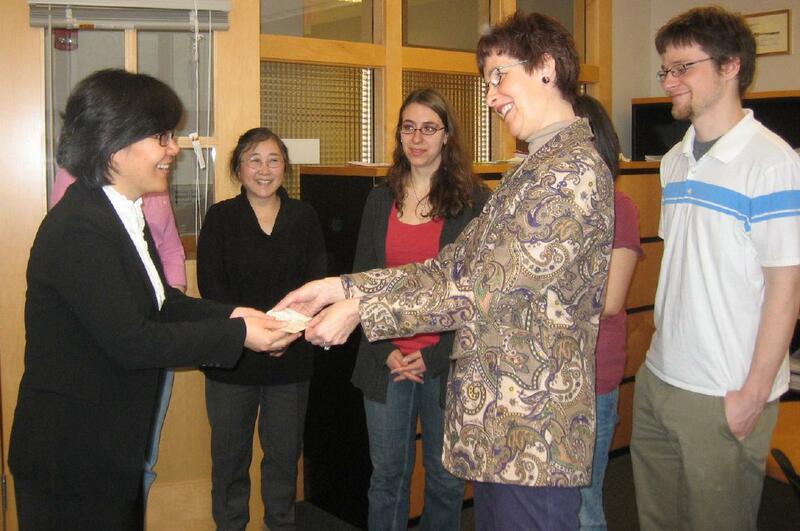 This was also the first time I was able to hand deliver the check. I explained that for most AAQI supporters, fighting Alzheimer’s is a personal struggle. We have/had family members and friends with the disease and we have seen the devastating results. Every stitch in every quilt is made with purpose and with hope, and now that hope rests with these talented and dedicated scientists. The team which will soon begin work, financed in part by the Alzheimer’s Art Quilt Initiative, is from left to right: Joseph Braymer, Dr. Mi Hee Lim, Nathan Merrill, Jung Suk Choi, Nicole Schmidt, Yihong Liu, and Alaina DeToma. 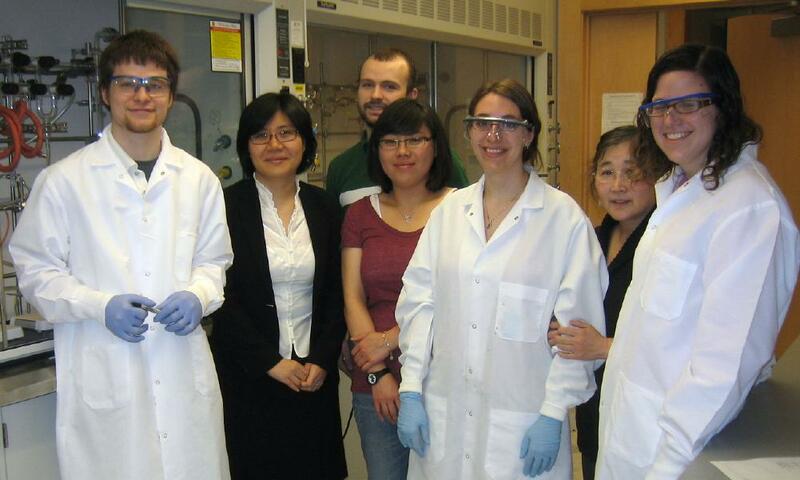 They hope to create a new class of molecules that will be used as chemical probes to better understand the role of metal ions in the pathology of Alzheimer’s disease and to hopefully create therapeutic agents for metal-ion chelation therapy. Godspeed! If you would like to support the Alzheimer’s Art Quilt Initiative, there are 28 Ways You Can Help. For now I’m going to rest my check-writing hand and go make another quilt. There is a remarkable film called “The Captain” that you need to watch. It will take less than four minutes, maybe a little longer if you have to run for a tissue. Heartwarming doesn’t begin to touch it. It was narrated by Allison Janney, the actress who portrayed Press Secretary C.J. Cregg from the television series The West Wing. (I have watched all seven seasons on my iPod, multiple times. There. I said it. ) Were Ms. Janney to read a few pages from the phone book, I would be enthralled, but hearing her speak the words of the poem Invictus by William Ernest Henley went far, far beyond that. The Captain stars a young man named Daniel Long. He is terrific. A little bragging here: I went to college with his parents, Patti and Tim Long. My Steve (and her Tim) were roommates. If you’ve heard me tell the story about hand quilting on a long car trip, my 32″ oval hoop wedged between my chest and the dashboard of our Chevette, the part I left out was that we were on our way to Tim & Patti’s wedding. Now you know. Turns out that Daniel’s brother Aaron, who is also mentioned in the credits (get out your magnifying glass), is friends with Allison Janney. Well, I’m not incredibly well versed on how this “six degrees of separation” stuff works, but I have a big enough mouth. I asked Tim to ask Aaron to ask Allison (see we’re on a first name basis already) if she would autograph some fabric for a Priority: Alzheimer’s Quilt. Long story short, she said yes! And she signed SEVERAL pieces of fabric! I get dibs on one, but I’m opening it up to anyone else who would like to create a Priority: Alzheimer’s Quilt with the other four. 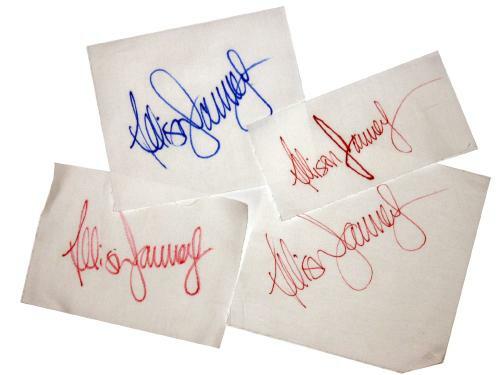 February 27 Update: The first four volunteers who commented to the blog were selected to receive one of the Allison Janney signatures. Thanks to everyone who volunteered. The Alzheimer’s Art Quilt Initiative did VERY well at International Quilt Festival in Houston! We’re getting close to confirming all the sales and updating the web page. You can see photographs of the show as it unfolded along with the numbers of the quilts that sold at: http://twitter.com/AAQIUpdate. AAQI board member Nanette Zeller also blogged about our success in Houston as did Lynn Koolish from C & T Publishing. Special thanks to Bonnie McCaffery for creating this YourTube video at the show! Please don’t forget to tell your friends that the World Quilt Federation Smackdown Challenge Auction starts November 1 in honor of National Alzheimer’s Awareness Month. Please bid generously as all profits fund Alzheimer’s research.